Viewing entries tagged with pgconfeu. Return to full view. Posted on Dec 10, 2012 at 16:45. Tags: conferences, fosdem, pgconfeu, pgconfeusite2012, postgresql. In our conference feedback, we also asked for a number of things that are designed to help us decide what to do next year. The most obvious one, of course, being where the conference should be next year. Without even reading the texts behind the truncated texts, it's obvious that this didn't help us very much. The only city that scored higher than the average was Vienna - and it's likely not a coincidence that this is the option that's geographically closest to Prague, so it's the closest one for most of our attendees. 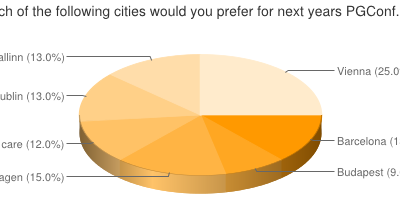 In general we have to declare this as a draw - all suggested cities seem to be equally popular. So no direct guidance from there. While we have nothing to announce yet, we have already started considering locations for next year - but it won't be announced until we know something for certain. Posted on Dec 9, 2012 at 16:12. Tags: conferences, pgconfeu, pgconfeusite2012, pgeu, postgresql. We've actually managed to improve the over all impression slightly - last year had 51% giving us a rating of 5, and this year we got 57%. Event more important, we've kept the rate of people who are giving a score of 3 or lower at less than 1%. According to the numbers, the programme quality was slightly worse than last year - down to 65% giving it a rating of 5, vs 71% last year. We still have 97% giving 4 or 5 - up from 95% last year (well within the margin of error). All in all, I think we can safely say "job well done" to all the people who worked on the conference - thanks for all your efforts! PGConf.EU 2012 - schedule is up! Early bird ends in less than a week! Posted on Sep 3, 2012 at 14:30. Tags: conferences, pgconfeu, pgconfeusite2012, postgresql, schedule. We've finally finished the schedule for PGConf.EU 2012 in Prague in October, and put it up at http://2012.pgconf.eu/schedule/. Of course, a schedule is never truly finished - we will update it if necessary as we get closer to the conference. But the basics are there. Our Opening Keynote this year will be delivered by industry veteran Joe Celko, who will give us an interesting look at the past and the future of SQL and other database technologies. And if you read and enjoyed the SQL for Smarties book from Joe, you have a chance to attend a full day of training with him as well! Limited number of seats available, so register quickly! Other than Joe, we have many great talks from well known speakers in the PostgreSQL community such as Simon Riggs, Bruce Momjian, Josh Berkus, Dimitri Fontaine and Devrim Gunduz, as well as a number of new speakers with exciting stories to tell! There is more than enough content for everybody! Early Bird registration for the conference ends this Friday. This is your last chance to register at the reduced price, after which the full price will be charged. We hope to see you all in Prague this October! Posted on Jul 2, 2012 at 20:11. Tags: conferences, pgconfeu, pgconfeusite2012, pgeu, postgresql. PostgreSQL Conference Europe 2012 in Prague, The Czech Republic, on October 23-26 is now accepting registrations for conference attendance at http://2012.pgconf.eu/registration/. The Early Bird special price will be available until September 7th, but that's no reason not to get your registration in early! Should you for some reason want to register for just a part of the conference, single day rates are also available at this time. We have also announced our training schedule at http://2012.pgconf.eu/training/. Take your chance to attend training on the day before the conference, held by major PostgreSQL community contributors like Bruce Momjian, Simon Riggs and Greg Smith, and relational database veteran Joe Celko. Local PostgreSQL experts Tomas Vondra and Pavel Stehule will also give training in Czech. These trainings have a limited number of seats available, so register early to ensure there is one for you! And don't forget - the call for papers is still open! If you have already submitted a talk, or are planning to submit one, we suggest you wait to register until you have received a confirmation if the talk was accepted or not. The early bird rate will be available long enough for you to register after you have received this notification - and if your talk is accepted, attendance is of course free! As usual, if you have any questions, don't hesitate to contact us at contact@pgconf.eu. Posted on May 15, 2012 at 19:49. Tags: conferences, pgconfeu, pgconfeusite2012, postgresql. The call for papers for PostgreSQL Conference Europe 2012 in Prague, the Czech Republic has now been posted. As usual, we are looking for talks on all topics related to PostgreSQL. At this point, we are looking for submissions for regular conference sessions - we will post a separate call for papers for lightning talks at a later time. We are also still looking for sponsors - please see our website for details about the sponsor benefits and the costs. Follow the news feed on our site, or our Twitter feed, for news updates! Posted on Mar 27, 2012 at 14:59. Tags: conferences, pgconfeu, pgconfeusite, pgconfeusite2012, pgeu, postgresql. It's time to mark your calendars - PostgreSQL Conference Europe 2012 will be held at the Corinthia Hotel in Prague, the Czech Republic, on October 23-26 2012. As previous years there will be one day of professional training (Tuesday 23rd) and then three days of regular talks. At this point, we are also opening our sponsorship program. We are looking for sponsors at all levels, from Bronze to Platinum. Please see our website for details about the sponsor benefits and the costs. Follow the news feed on our site, or our Twitter feed, for further information as we finalize details. Posted on Nov 6, 2011 at 16:36. Tags: conferences, pgconfeu, pgconfeusite, pgeu, postgresql. Those are pretty fantastic ratings. 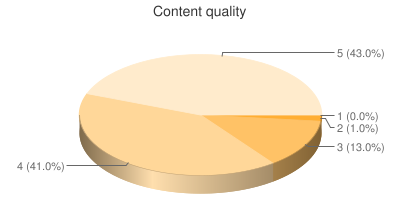 A full 84%25 rated the content quality as 4 or 5, and only 1%25 rated it as less than 3. That basically comes down to there being no talks of bad quality. This confirms the feeling that we had when we tried to pick out the talks for this year - the number of great submissions where just huge. We had to reject around half the talks submitted, and there were only a few of those that we rejected because we thought they weren't very good. Most were simply rejected because we didn't have the time and space to accept them all. 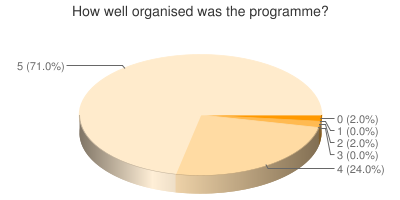 The ratings people have given our speakers confirm what we have always thought to be one of the reasons people like the conference - and many other PostgreSQL conferences as well: you get to listen to and talk to the people who really know what they are talking about. Often because they are the very people who wrote the software in question. 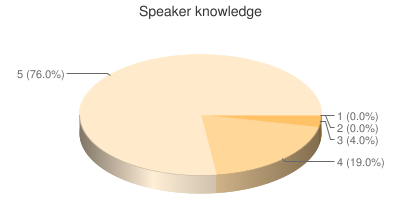 A whole 96%25 of all the ratings gave our speakers a score of 4 or 5 for their knowledge of the topic. And nobody scored lower than 3. These truly are the experts you get to meet! This really is the reason why people come to the conference, and keep coming back the next year - our outstanding speakers! Thank you all for showing up this year to give your presentations, and we hope to see you again next year! Posted on Nov 4, 2011 at 09:53. Tags: conferences, pgconfeu, pgconfeusite, pgeu, postgresql. The detailed feedback for each speaker will be sent out during the day today, unless we run into any unforeseen technical issues, and I will try to summarize the conference-wide feedback here. If any particular note that you posted is not referred here, don't worry - we read them all, but there are far too many of them to post here. Not a single vote less than 4, on a scale of 1-5, for the overall impression. And only one below 4 for the programme. I can only say a huge thanks to the big group of volunteers who ran this conference, and made it what it was. Clearly you did a good job! Posted on Sep 19, 2011 at 16:57. Tags: conferences, keynote, pgconfeu, pgconfeusite, postgresql, schedule. A little bit later than we hoped, we have now finally published the schedule for pgconf.eu. Three days full of presentations to choose from - and of course also the always popular lightning talk sessions. The schedule listed now is what we consider the final version, but we obviously reserve the right to make last-minute modifications both to which talks are included and exactly when they are scheduled, if necessary. Keynote speaker We are also happy to announce that the conference keynote will be presented by by Ram Mohan, CTO of Afilias, who will be talking about how Afailias has built their company on open source solutions, and how this has turned into a great success. Afilias as a company has been deeply involved with PostgreSQL for a long time, including employing former Core Team member Jan Wieck and leading the development of the Slony replication system. Posted on Aug 21, 2011 at 20:45. 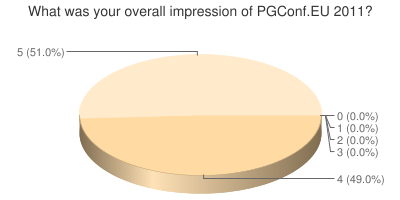 Tags: conferences, pgconfeu, pgconfeusite, pgeu, postgresql. Seats are limited at these trainings, so we advise you to book as soon as possible. Training is booked as additional options on the standard conference registration form. Since we are still in vacation period for a lot of people, we have decided to extend the deadline for our call for papers. The new deadline for submitting talks is midnight, Sep 2nd. We will, however, start approving talks that have already been submitted as soon as possible, and announce them as soon as we have decided. That means that if you want to be sure that we will have time to review your talk, you should submit as soon as possible! Full call for paper details are available on the site.